Strong south winds will develop by mid morning into early afternoon with gusts up to 35 mph possible this afternoon. Recent rainfall over the weekend may limit the overall fire weather risk for some locations. The strong winds will result in increased fire spread rates for the afternoon hours for much of the area, however. Warm and windy conditions will continue for Tuesday and Wednesday ahead of a strong system that will move into the Plains. The airmass across eastern Oklahoma and western Arkansas will become unstable by Wednesday afternoon, with strong wind fields in place. 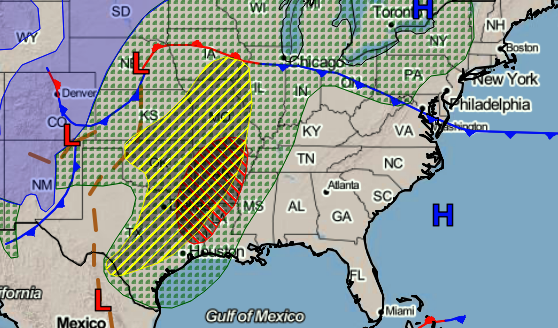 At the surface, a dryline will develop across southwest Oklahoma, with a cold front extending northeast into Kansas. A strong capping inversion will likely limit severe storm development until late afternoon. However, strong deep layer shear will support some storms developing into supercells. Large hail and damaging winds will be the main threats, but tornadoes will also be possible.